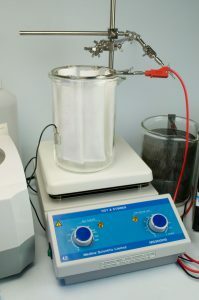 – Long life plating solution – silver replenished from electrodes. 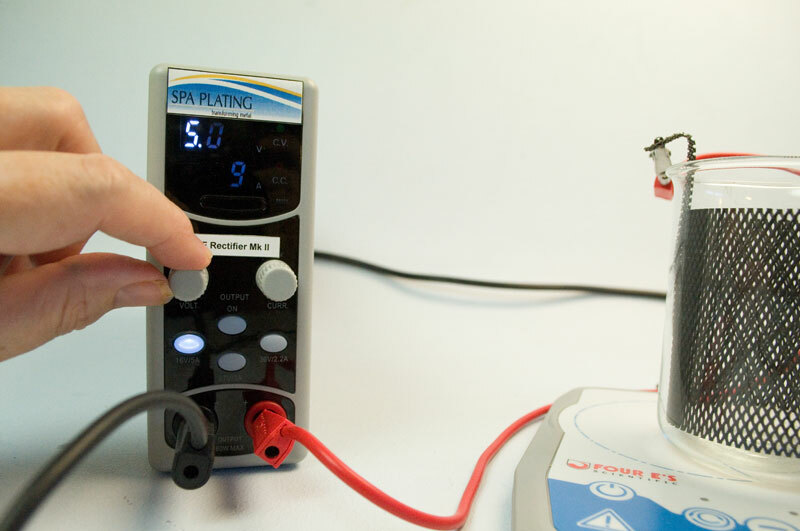 Because this Silver Tank Plating Kit – HS uses a ring of 6 pure silver anodes rather than one of our Mesh Electrodes, you can build substantial thicknesses of silver quickly – plating rates of up to 3 microns every five minutes are obtainable. 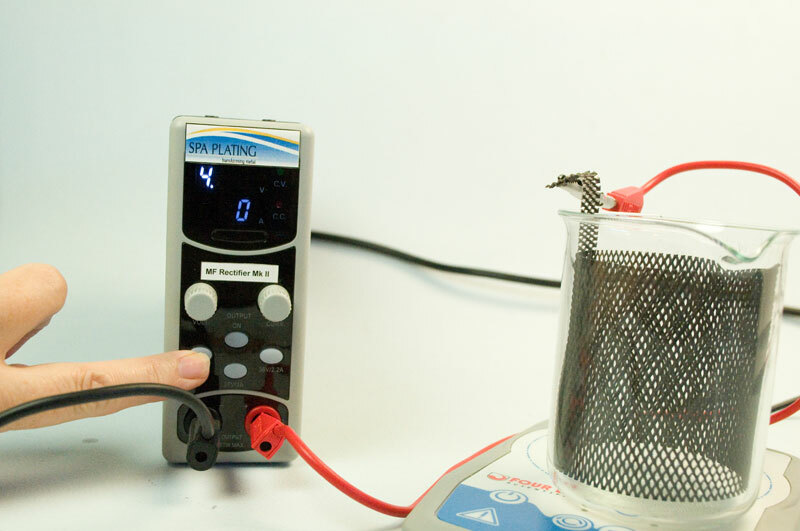 There’s no yellowing of deposit after rinsing in hot water and the plating solution lasts longer because the silver that plates out of the solution is replenished by silver from the sacrificial silver anodes. Can require polishing to achieve a high shine. 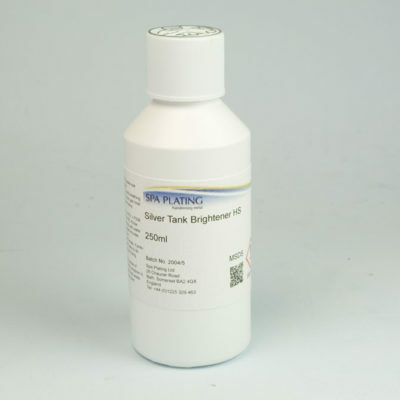 If you are planning on silver tank plating on to copper and its alloys including brass and bronze you’ll need to brush plate a barrier layer of gold flash to protect your tank plating solution. 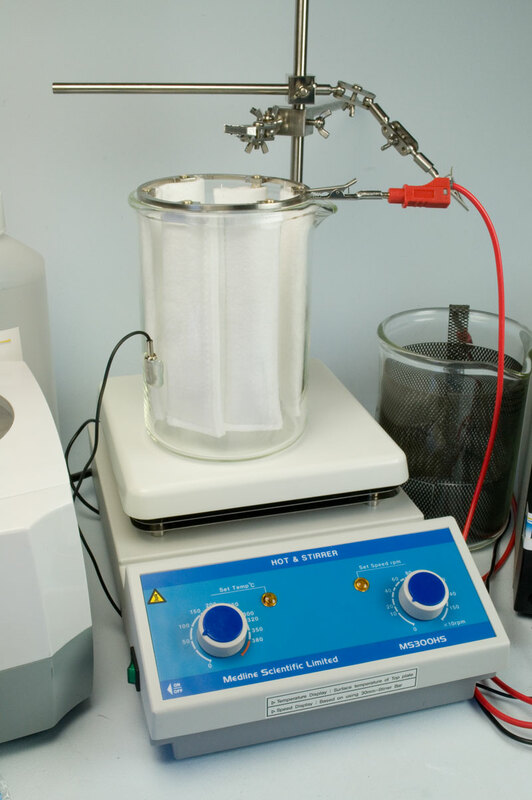 To get the best out of the Silver Tank Plating Solution – HS you need to heat it to 50 degrees centigrade with moderate agitation using our Hot Plate Stirrer. 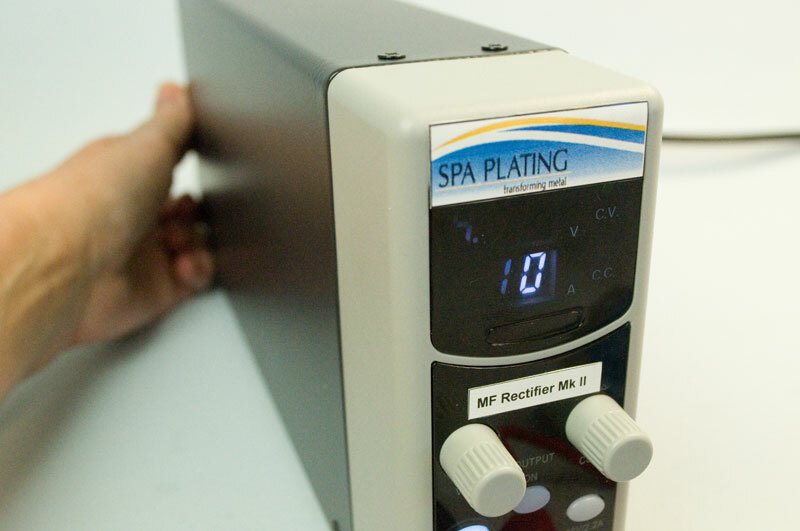 Immersing the plated item in hot water at 60-70 degrees centigrade for 1-2 mins (or 80 – 90 centigrade for 10 – 60 seconds) immediately after plating greatly helps the solution’s anti-tarnish/anti yellowing properties. 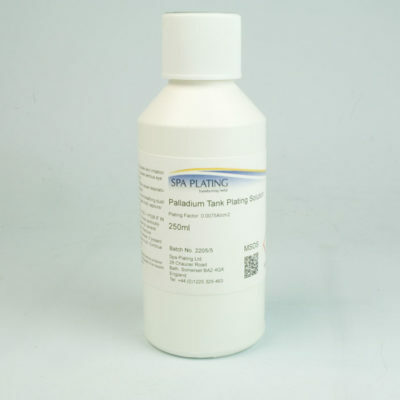 The pH stays relatively stable througout the process compared to our other tank silver plating solution. 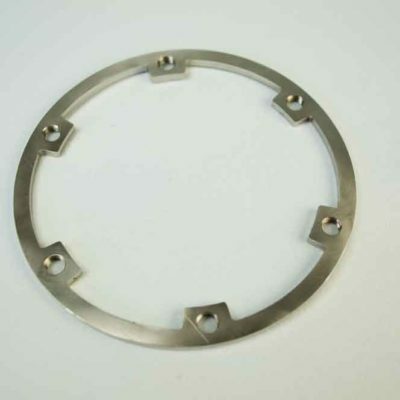 Designed to be used with our electrode ring fitted with 6 silver electrodes Higher plating rates of 3 microns every five minutes are obtainable. No yellowing of deposit after rinsing Greatly reduces the need for post plating polishing – particularly important if you’re plating very delicate or complexly shaped items. 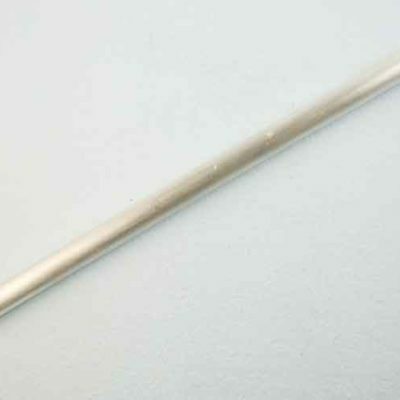 The silver from the silver electrodes replenishes the silver plated out from the solution Makes the Silver Tank Plating Solution – HS long life which means you buy less solution in the long run. To get the best out of the Silver Tank Plating Solution – HS you need to heat it to 50 degrees centigrade with moderate agitation. 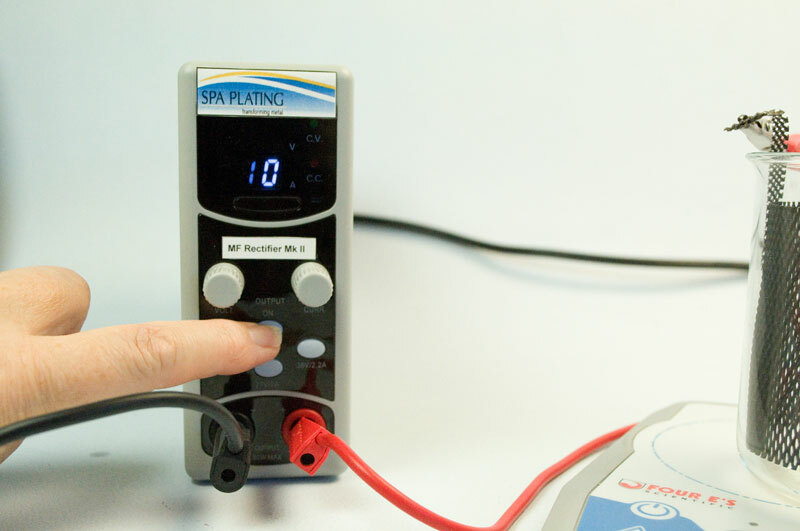 Fully variable heat control Allows you to keep your gold plating solution at just the right temperature for optimum performance. 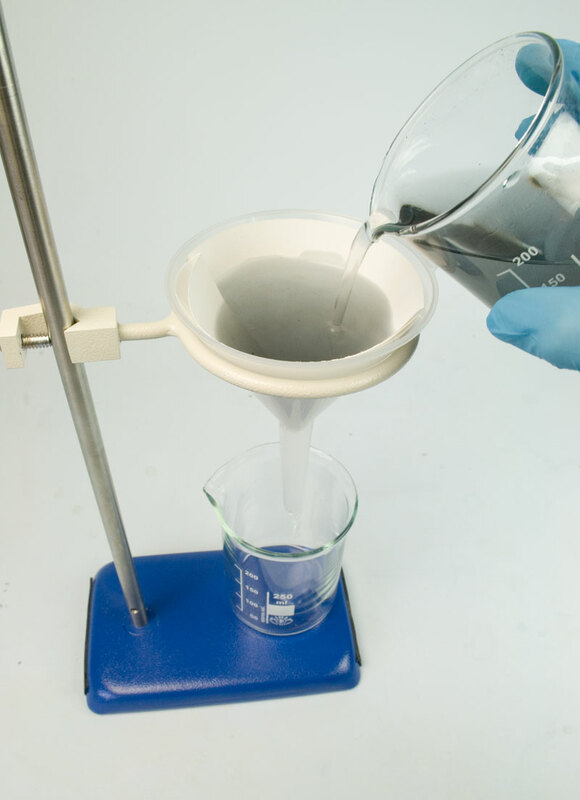 magnetic stirrer at the bottom of the beaker during plating. Mechanical agitation is a safer alternative to air agitation, as it eradicates any risk of the aerosol effect of the plating solution. Mechanical agitation keeps the gold plating solution moving over the surface of the item being plated in a consistent way, again maximising the efficiency of the plating process. 1litre sizes. 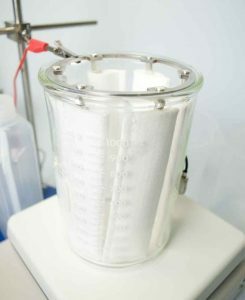 With the Mesh Electrodes inserted, the internal dimensions of each size beaker are as follows; 250ml; Height – 7cm, Diameter – 6cm 500ml; H – 10cm, D; 8cm 1Lt; H;13cm, D;8cm Plate different sized objects individually or in small batches, from rings to trophies. Has six threaded holes to securely hold six of our Copper Electrodes for 1 L Beaker This allows you a high degree of flexibility. 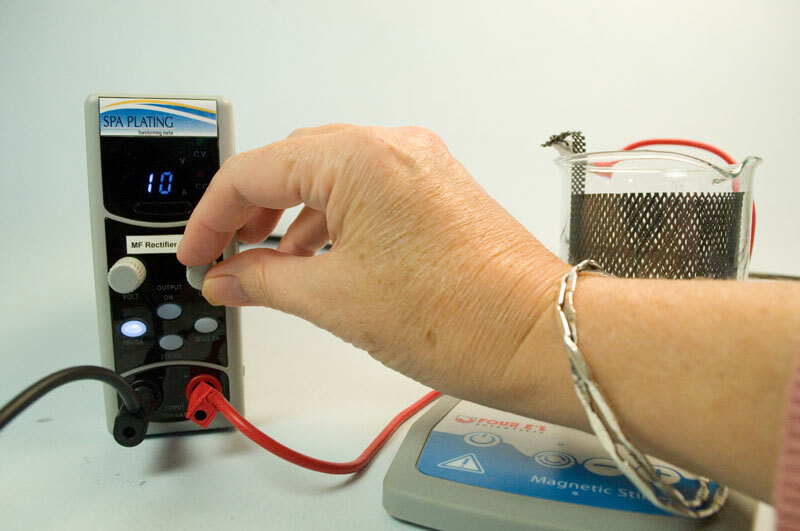 If you only have a small electroforming job, then you may only want to purchase 2 electrodes. Or you can buy the full set of six and arrange them according to the size and shape of the object you’re plating. 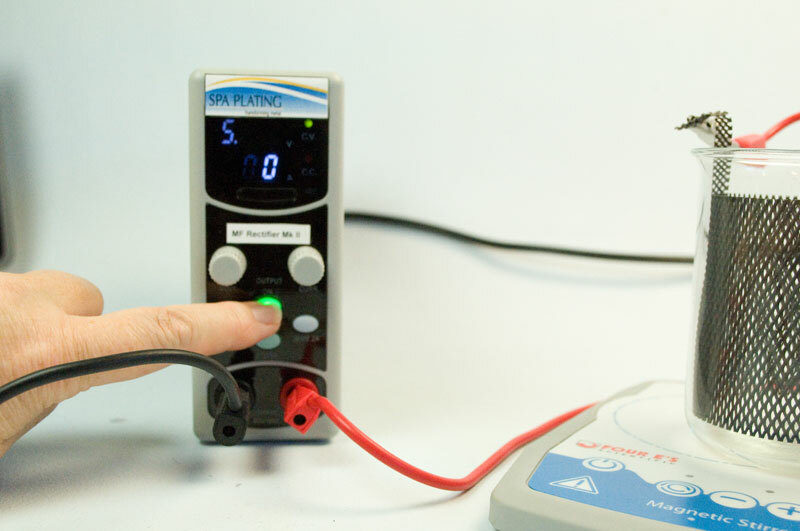 Either way, you are ensuring you get the optimum performance from our Copper Electroforming Solution. 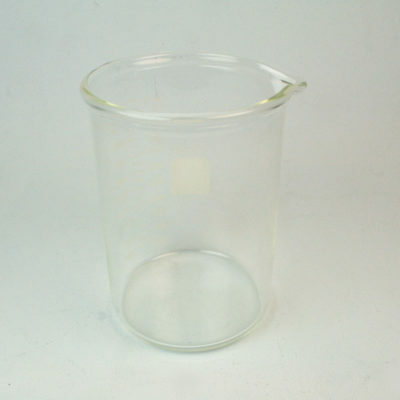 When used with clamp, can moved up or down the stand in any position to fit any size of plating beaker. Has ball head join point at one end to accommodate crocodile clip Ball head allows complete 360 degree movement of crocodile clip, so you can quickly and easily make fine adjustments to the position of you work in the gold plating solution. Easy to bend by hand You’ll be able to shape jigs easily for complexly shaped items as well as a number of smaller items all at once. NB – Do not place on or near the Hot Plate Stirrer! The six beakers provide for 2 rinses after the ultrasonic cleaning stage, 2 rinses after the ActiClean stage and 2 rinses after the gold plating stage. The sixth and final rinse should be deionised water. Includes 1Rinse Beaker (1 Litre),1Funnel Holder1Funnel 1 Litre, Filter Papers 1 Litre ( 5 pack) All tank plating solutions occasionally need filtering to remove particles that build up over time. Our filtering kit makes the process of keeping your tank plating solution in tip top condition easy to set up and mess free. 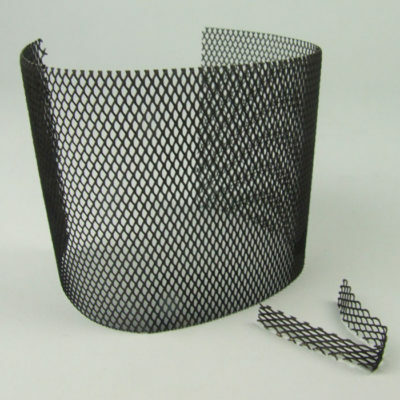 Added to this, regular filtering can help you save money by extending the working life of your tank plating solution. The advertised kit is the 1 litre kit. 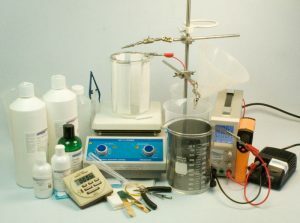 If you want to downsize to the 250ml kit you will need to remove the 1 Litre Plating Beaker, 1 Litre Beaker Ring, 6 x Silver Electrode for 1 Litre Beaker, 6 x Anode Bag for 1 Litre Beaker, Stirring Bar (Large) and 1 litre Silver Tank Plating Solution HS. 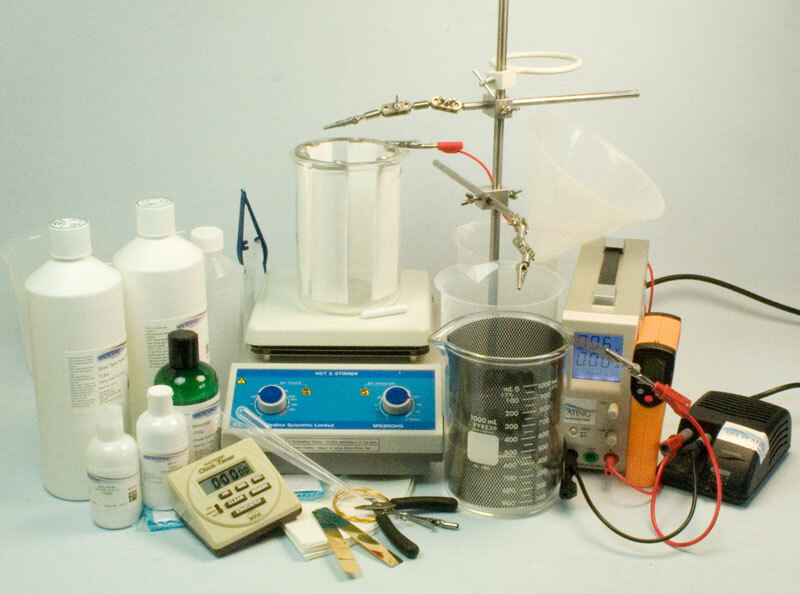 You will then need to add the 250ml Plating Beaker, 250ml Beaker Ring, 2 x Silver Electrodes for 250ml Beaker, 2 x Anode Bag for 250ml Beaker, Stirring Bar (Medium) and 250ml Silver Tank Plating Solution HS.